A bank garnishment is a means of collecting debts by recovering money directly from a debtor’s bank account. This process is usually a result of a Sheriff’s or Marshal’s Bank Execution. Ignoring outstanding debts can lead to wage garnishment and the freezing of bank accounts. While there are many tactics to collecting debts, bank garnishment is often the most effective way of recovering money from a debtor. When you employ a debt collection agency such as Accounts Retrievable, we attempt to collect debts through other means as it is the best practice when a debtor pays willingly. Part of doing this is having a vigilant and persistent debt collection agency that can work to understand the debtor and their current financial situation to find a solution that works for all parties involved. However, there are some debtors that are simply unwilling to pay or unwilling to make the sacrifices necessary to pay their debts. It is at this point where bank garnishment or wage garnishment is the solution to recovering judgments and debt. Bank garnishment is effective since the money is taken directly from the bank account of the judgment debtor. Not only will the creditor get their money back, but the debtor is forced to face their financial situation. When the action taken affects a debtor’s ability to pay other bills or buy things they want, people can not help but address this unfortunate situation. At Accounts Retrievable, we have a long running track record of recovering debts while maintaining respectful and legal practices. We pride ourselves on being able to help our clients collect judgments while maintaining positive relationships with the creditor and debtor alike. Some debt collection agencies are highly aggressive to the point of harassing debtors. However, we feel that all people should be treated respectfully. This is not to say that we are not aggressive, we just have a mission to have positive business relationships and abide by the law. Any member of our staff will be pleased to answer any questions you may have about collecting money for you. You may fax or mail your Judgment to our office. We will follow up with an acknowledgment of receipt and provide you with a "Placement Form" to sign. 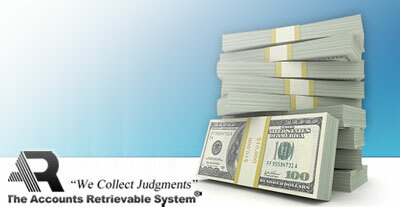 This form reflects the fact that the Judgment is unpaid and you desire for us to collect for you. The Accounts Retrievable System, Inc.